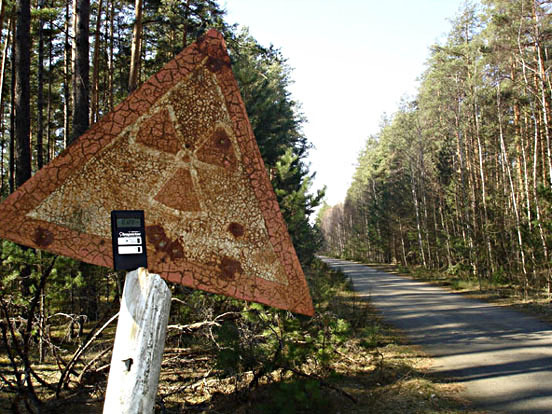 This road is in the dead zone around Chernobyl. The sign is barely readable after 21 years, but the radiation still remains. Elena Filatova, motorcyclist and photographer, is still visiting Chernobyl and writing about it. Her latest photo essay is titled Spring 2007. Her haunting photos and evocative words raise questions that we still do not have answers for 21 years after the disaster. Elena wants to make sure that Chernobyl is not forgotten. The 21st anniversary of the Chernobyl disaster will occur on April 26th. Will we be any wiser by the 30th or 40th anniversary? I would hope so, but according to Elena, the UN cover-up continues and the need for more energy has politicians glossing over the omissions of the past. This entry was posted in Chernobyl and tagged Chernobyl, Elena Filatova, Kid of Speed. Bookmark the permalink.